2. Heat oil in ovenproof skillet over medium heat. Add onion and garlic and sauté for 5 minutes. Add chickpeas and sauté for another 3 minutes. 3. Add diced tomatoes, cumin, cinnamon, paprika, red pepper ﬂakes, and bring to a boil. Turn the heat down and simmer for 10 minutes. 4. Add Swiss chard and cook down for about one minute. 5. 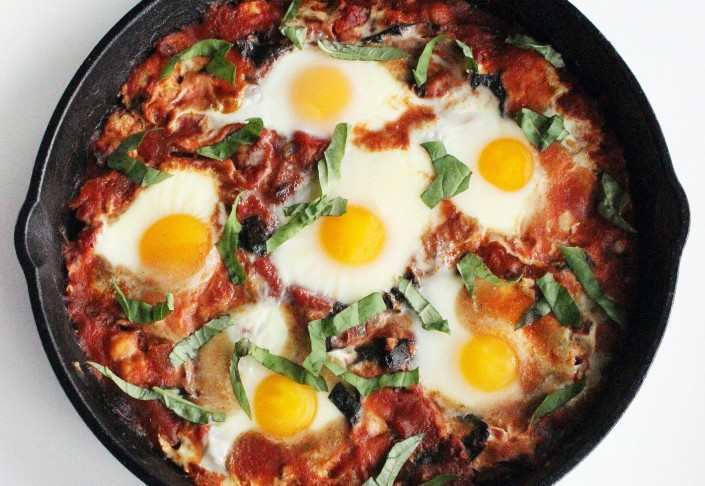 Make six little wells in the tomato and chard mixture, and add eggs to the skillet slowly. 6. Move the skillet to the preheated oven, and bake for 15 to 20 minutes or until the whites are set. 7. Remove from oven, sprinkle with basil, serve, and enjoy!